SoftBank Group Corporation is supporting the World Robot Summit as a global partner. 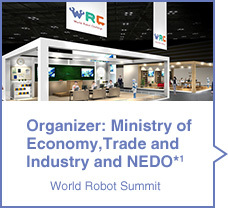 We - SoftBank Group Corp. (SoftBank Group) - will support the World Robot Summit (WRS) hosted by the Ministry of Economy, Trade and Industry and NEDO*1 in Japan in 2020. SoftBank Group will support the event by providing free technical support and other assistance including our humanoid robot, Pepper. WRS aims to bring together advanced robotics technologies that are attracting attention in Japan and around the world to create opportunities for devising practical ways of using robots, both by resolving issues and by deepening understanding of robots and facilitating lively debate on their use. The event will include the World Robot Challenge (WRC), which features robot competitions, and the World Robot Expo (WRE), an exhibition of robotics technologies. The WRC will include a Junior Category open to entrants up to 19 years old in which teams chosen from around the world will compete to develop applications and ways of using robots that are needed in schools. Pepper, the humanoid robot from our group company, SoftBank Robotics, has been selected as the standard robot platform to be used in this Junior Category competition. Based on our common corporate philosophy of "Information Revolution - Happiness for everyone," we are supporting the World Robot Summit as a way to expand the potential of children around the world who hold the future in their hands. Pepper is a human robot with the ability to act and speak with human being, and equipped with a function to recognize people’s emotions and feelings. Pepper was launched in Japanese market in 2016, people can enjoy over 300 applications from appstore, and make program easily using "Choregraphe" with simple and high-quality GUI. With the IoT era now well underway, a wide variety of internet-connected devices will continue to grow rapidly in number, increasing the rate at which they generate big data. Artificial intelligence will use this big data as a learning resource, likely giving rise to a “Super-intelligence” that will far surpass human intelligence. It may be that we are heading toward a time when robots equipped with Super-intelligence will emerge to work with humans to help solve the problems that have been unsolved until now. In anticipation of the Singularity, the point at which artificial intelligence surpasses human intelligence, I would like to see the young people who will inherit this future become increasingly familiar with robots. Robotics will play an important role in ushering in the next stage of the Information Revolution. I want to advance this field so that we can create a world in which everyone can live happier lives. It was with this in mind that we chose to support the World Robot Summit, which will bring together robotics technologies from all over the world. My hope is that, by realizing the ideas that arise from this forum which brings together wisdom from around the world, we can contribute to greater human happiness together. using our knowledge and know-how gained from the School Challenge of our Pepper Social Contribution Program. The School Challenge of our Pepper Social Contribution Program is a program undertaken as part of our CSR activities. We provide programming class opportunities in schools for children who will play a key role in a future where people and robots coexist. Programming will become a mandatory subject in Japanese elementary schools from 2020. We are assisting with the educational preparations for this shift by providing Pepper robots on loan for free. The program started in April 2017 and is contributing to the education system by helping to develop logical thinking, problem solving, and imagination skills in children.